L'œuvre est signée d'un certain Donato Giancola. Le Monsieur est une sommité dans le monde l'illustration SF/Fantasy. En vrac, il a signé une petite centaine de Cartes Magic de 1996 à 2004, des couvertures de rééditions de 2001, l'Odyssée de l'Espace et The Lord of the Rings (ainsi que des CCG Middle-Earth), des couvertures de vieux comics Star Trek sans parler de ses contributions aux univers Iron Man, Superman, Dennis Rodman, ... Bref, il touche à beaucoup de choses et a gagné de nombreux prix pour ses œuvres. Pour la petite anecdote, il a même illustré les couvertures de huit bouquins de Barbara Hambly ^^ ! Le pauvre ! Plus sérieusement, je vous invite chaudement à visiter son site officiel pour découvrir de quoi est capable ce Donato Giancola. Et oui, Star Wars Galaxy … ça remonte tout ça ! 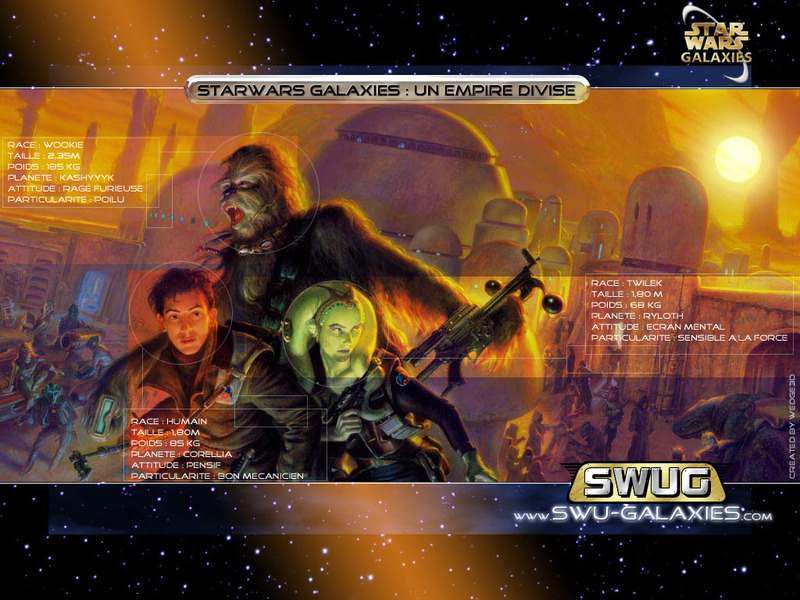 Et d'après Wookieepedia, il serait également à l'origine de quelques dessins du célèbre (ou pas) ouvrage From Pencil to Pixel: The Art of Star Wars Galaxies, dessins sur lesquels je n'ai malheureusement pas réussi à mettre la main. Et même que si vous cliquez ici, vous verrez que Dark Nihilus, il a des yeux en fait ! 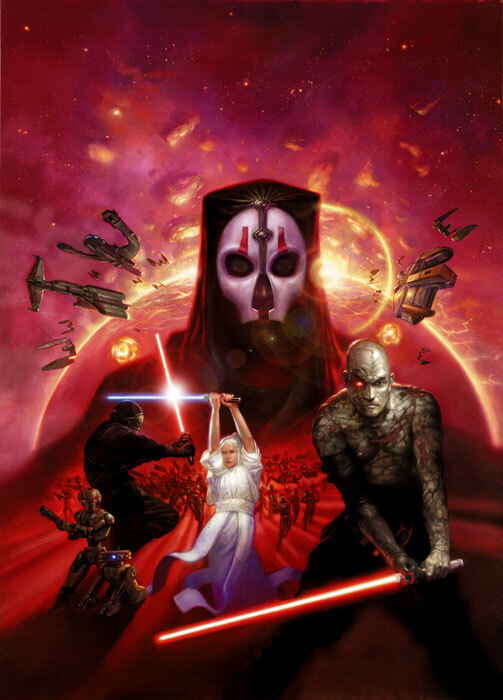 Entre le portrait d'Obi-Wan et ses contributions à Star Wars Galaxy et Kotor, voici trois bonnes raisons de surveiller de près les futures annonces sur cet ouvrage dont on ne sait toujours pas le contenu exact ! Affaire à suivre … sur SWU ! "When Star Wars debuted in 1977, it revolutionized the visual landscape of mainstream American filmmaking, transporting fans to new galaxies and introducing them to countless now-classic characters, costumes, aliens, planets, and starships. By 2005, with the last film in theaters, the Star Wars Saga had become a phenomenon impacting cultures across the globe. From the beginning, the Star Wars aesthetic was influenced by comic book artists from the 1930s to the 1970s; famed illustrators Chesley Bonestell, John Berkey, Frank Frazetta, and others; as well as classical artists. 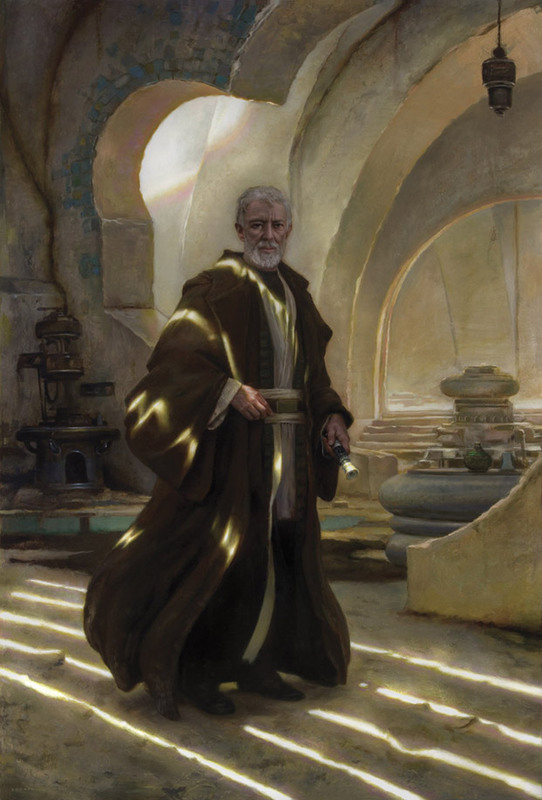 Just as George Lucas drew upon the work of N. C. Wyeth and Norman Rockwell for his own visual inspiration, he has now invited more than 100 of the most well-known and promising working artists-across several disciplines, genres, and countries-to draw upon the entire Star Wars galaxy for inspiration. 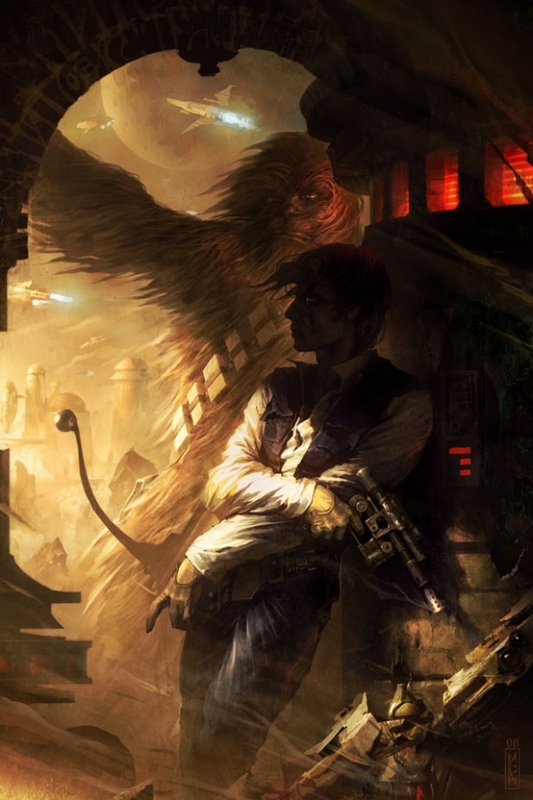 Star Wars: Visions collects these magnificent artworks for the first time. Featuring pieces by renowned artists such as Amano, Allan R. Banks, Harley Brown, Gary Carter, James Christensen, Michael Coleman, Kinuko Craft, Jim Dietz, Phillipe Druillet, Donato Giancola, Ann Hanson, H. R. Giger, Daniel Greene, Ron Kleeman, Arantza Martinez, Syd Mead, Moebius, Paul Oxborough, Alex Ross, Anthony J. Ryder, Dolfi Stoki, William Stout, Dan Thompson, Julie Bell and Boris Vallejo, Scott Waddell, Yuqi Wang, and Jamie Wyeth, Star Wars: Visions is a breakthrough tribute to the worldwide inspiration that Star Wars has fostered for over three decades. Star Wars Visions: Limited Edition features more than fifty paintings and illustrations not seen in the trade edition, as well as "behind-the-scenes" shots of artists' working processes, preporatory sketches, and more. Presented in a delux format, with a real-cloth cover and clamshell case, the Limited Edition also comes with five 10 x 12" high-quality archival giclee prints, signed by artists Jamie Wyeth, Alex Ross, Moebius, Donato Giancola, and Daniel Greene." 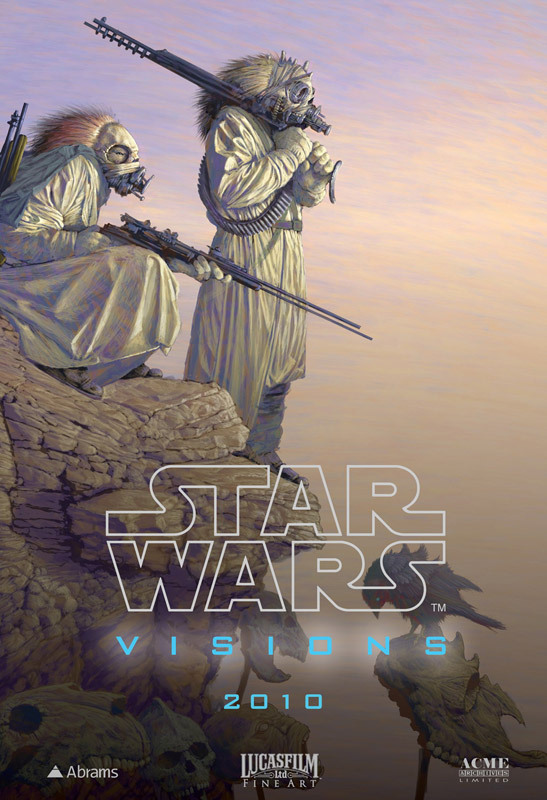 "Star Wars Visions collects a wealth of art - hand-picked by George Lucas - produced by a variety of artists, illustrators, designers and cartoonists, working across all genres and styles to celebrate their favourite characters, themes, worlds and moments from the Star Wars Universe. The full list of contributors is to be released incrimentally over the 6 months leading up to publication, with sneak previews, on starwars.com." On peut également voir que la version normale coûtera 40$ (26 chez Amazon) et la version collector 400$ (260 chez Amazon). Ça doit être un sacré collector. Après Bilal, Druillet et Moebius sur des dessins Star Wars H.R. Giger et son mémorable alien, que va-t-il nous pondre pour ce bouquin Julie Bell et Boris Vallejo, des illustrations kitschs mais cultes, j'adore ce style très sf ou fanatsy old school coloré et détaillé. Ce livre sera dans ma bibliothèque. Obligé. Et en édition limitée, ça va de soi. starwars.com a écrit: When Star Wars debuted in 1977, it revolutionized the visual landscape of mainstream American filmmaking, transporting fans to new galaxies and introducing them to countless now-classic characters, costumes, aliens, planets, and starships. By 2005, with the last film in theaters, the Star Wars Saga had become a phenomenon impacting cultures across the globe. 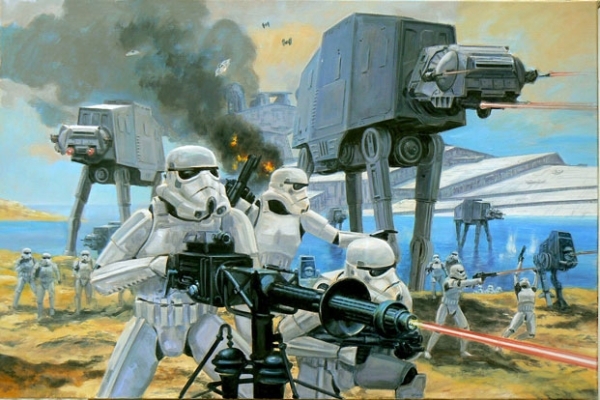 From the beginning, the Star Wars aesthetic was influenced by comic book artists from the 1930s to the 1970s, famed illustrators Chesley Bonestell, John Berkey, Frank Frazetta, and others, as well as classical artists. 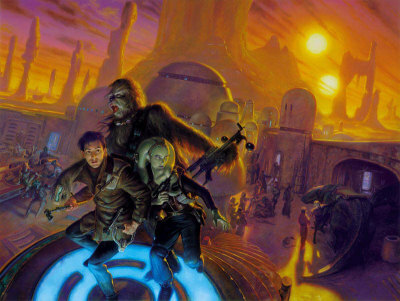 Just as George Lucas drew upon the work of N. C. Wyeth and Norman Rockwell for his own visual inspiration, he has now invited more than 100 of the best working illustrators, designers, cartoonists, and fine artists to create new work based on or inspired by their favorite characters, themes, landscapes, and moments from the Star Wars Universe. Star Wars: Visions collects the very best of these works together for the first time, celebrating more than thirty years of Star Wars with a roster of talent working in every style and genre. Capturing the imagination, beauty, and breadth of the films, television series, and more, Star Wars Visions is both a tribute to and a new way of experiencing a galaxy far, far away. 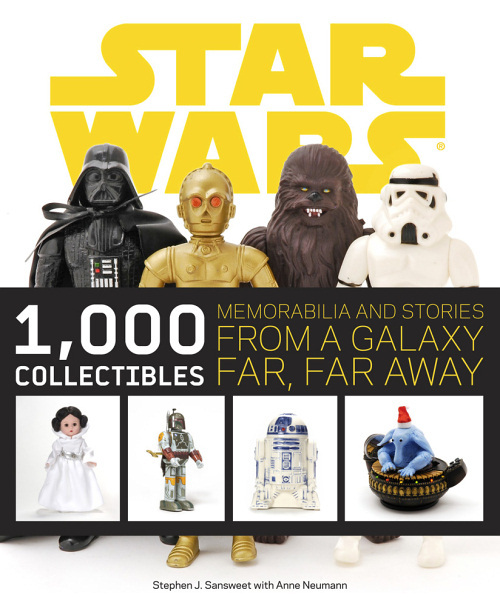 For the past six months, StarWars.com has been offering glimpses of some of the works featured in this collection. As we countdown until the Fall release of this hardcover art book from Abrams Books, we will continue to showcase new pieces. The films, television series and more ?